Saturday, May 13th at 10:30pm. Tickets $5 at the door. 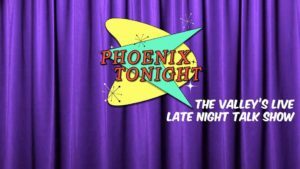 It took FIFTEEN episodes, but this month’s Phoenix Tonight finally fulfills a staple of late night talk shows — the animal segment! In the spirit of Joan Embry on Johnny Carson’s The Tonight Show, or Jack Hanna on The Late Show with David Letterman, cat behavior expert Missy Pruitt comes to Phoenix Tonight — and she’s bringing kittens! Join our live studio audience and see what a cute animal video on YouTube looks like IN PERSON! Also, stand-up comedian Dana Whissen joins us as a part of her whirlwind month-long tour around the Valley. If the kittens don’t make you squee, Dana WILL!